In February, goods by local makers of home décor popped up in The Store at Mia, in a shop-within-The Store co-sponsored by West Elm LOCAL. This month, in coordination with a new exhibition at Mia, “Seeing Nature: Landscape Masterworks from the Paul G. Allen Family Collection,” the Mia (Minneapolis Institute of Art) is debuting a new collection showcasing works by five makers from across the globe. Called “Inspired by Nature: 5 Global Makers,” the collection features home products, jewelry and textiles by makers from Israel and India to Argentina and Ghana. 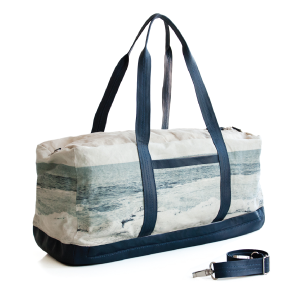 Lee Coren, who is based in Tel Aviv, uses cruelty-free vegan materials to create handmade, screen-printed fabrics that she transforms into tote bags with abstracted imagery redolent of sun and sky. Rupa Trivedi, who founded the company Adiv in Mumbai, designs and produces hand-dyed textiles embedded with recycled flowers gathered from temples. 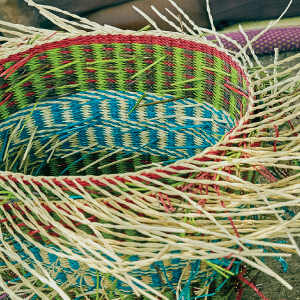 House of Talents, based in Ghana and Mali, was founded by Kate Herzog to connect artisans in developing countries with markets worldwide; The Store at Mia will showcase vibrantly colorful baskets handwoven by a Ghanian maker. Bird of Virtue, based in San Francisco, and Sibilia, in Buenos Aires, are jewelry companies whose makers fabricate necklaces and earrings out of organic materials that are rich with architectural detail, tactile texture and colors inspired by nature. “Inspired by Nature: 5 Global Makers” opens July 10 in The Store at Mia and runs through September 18. The exhibition that the pop-up accompanies features 39 landscape paintings from the private collection of Microsoft co-founder and philanthropist Paul G. Allen. Billed by Mia as “a must-see for Impressionism lovers,” the exhibition includes works by Monet (five paintings spanning 30 years), Manet and Cezanne, as well as by Gustav Klimt, John Singer Sargent, Georgia O’Keeffe, David Hockney, Rene Magritte, Max Ernst and Gerhard Richter.